Many people might cringe at the idea of using urine to fertilize plants, but urine has been used as a cheap, effective fertilizer around the world for thousands of years. Unlike human feces, urine from healthy people is sterile and pathogen-free. A 2007 study from the Department of Environmental Sciences in Finland showed that tomato plants fertilized with human urine produced nearly four times as much fruit. Most synthetic fertilizers contain a mixture of nitrogen (N), phosphorus (P) and potassium (K) to increase foliar growth as well as seed and fruit production. 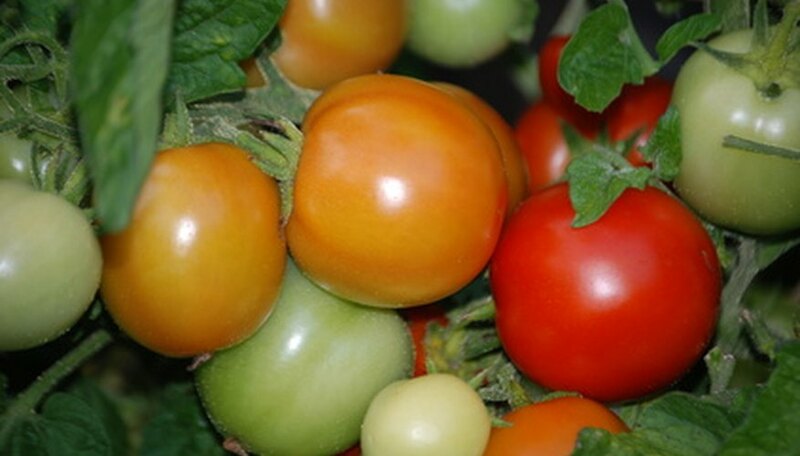 N-P-K fertilizers are crucial to the process of photosynthesis, where the tomato plant converts energy from sunlight into the sugars that it uses for food. Increased foliar growth from nitrogen creates a bigger surface area to absorb sunlight, which in turn leads to increased photosynthesis. Human urine is rich in the nutrients tomato plants need to grow well. When it's added to the soil, the nutrients in the urine are already broken down to their elements, which allows the roots to take in the nutrition and use it faster and more efficiently. Urine contains large amounts of urea, a nitrogen-rich compound that is produced synthetically for chemical fertilizers. Nitrogen supports healthy foliar growth, making leaves bigger and greener. Tomato plants that get adequate nitrogen are better able to resist disease and pests because they are stronger and healthier. Also contained in human urine is phosphorus, another essential macro-element in plant growth. The phosphorus in urine makes the plant grow faster, helping it withstand stress and disease. Phosphorus also supports strong root growth, which helps the plant take more water and produce more blooms. After the tomato plant has bloomed and begins putting its energy into fruit production, the potassium and phosphorus in urine increase the amount of sugar and protein in the fruits which leads to more abundant production and sweeter tomatoes. Just as a dog urinating on the lawn causes brown spots, undiluted urine applied directly to plants can damage leaves and roots. This is because of the high concentration of nitrogen, which actually burns the plant. If you use urine to fertilize your tomato plants, dilute it with clean water at a ratio of ten parts water to one part urine. When fruit production begins, stop using urine as a fertilizer. This will encourage the plant to put its energy into making tomatoes instead of growing more leaves.